They say that travel broadens the mind, and we now live in a world where virtual travel lies at our fingertips, and cheap flights mean that we can go abroad to a wider range of destinations more often. Even so, it is easy for our own (UK) vision of what is landscape photography to dominate and this is often reinforced by the vivid pixels and photo-workshop destinations that jostle for our online attention. How much do we know of our European counterparts beyond the occasional headline-grabbing price tag? Through Flickr I have been enjoying the work of several German photographers who give tempting glimpses of a countryside dominated by forests, lakes, woodlands and meadows and a quieter style of ‘landscape’ photography. So I was delighted that Claudia Müller agreed to answer my questions for On Landscape. Tell us a little about the area in which you live and photograph? I live in a sparsely inhabited region in the northeast of Germany, in a city halfway between Berlin and the coast of the Baltic Sea. The state is called Mecklenburg-Vorpommern – a stretch of land full of vastness and light, endless beaches, deep mystical forests, silent bogs and a unique flora and fauna. A place of longing for poets and painters for many centuries, created by glacial periods and shaped by human beings since then. A region full of contrasts and contradictions. The landscape is rarely spectacular or dramatic, but above all there is a wide sky. What themes or styles are popular in German landscape photography? Is it location-driven as in the UK or more individual? I‘m deeply rooted in Germany’s nature photographers’ scene and I’m member of the GDT (German Association of Wildlife Photographers), an association which has its origins mainly in wildlife photography. 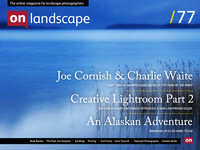 Therefore landscape photography still has a low significance, and such images are often considered as by products. You can find a lot of typical “calendar-photography”, showing the iconic landscapes of the world, but without any attempt at a personal interpretation, or realization of new perceptions. But there are also a few darn good photographers working on long-term projects, creating very personal impressions of the regions they live in. I’m still living in the same city in which I was born, and I have never left this town for more than six weeks at a time. It’s a region which was extremely influenced by the German reunification with all the economic and social changes. So, at a time of “working-nomadism”, my biography seems to be rather unusual. I am deeply entrenched here, and I have experienced the changes of this landscape as intensively as those of my own personality. I was a curious child with too many books and way too much fantasy. My parents taught me a deep love for nature and a great respect for it as well. I explored the world of photography with a little compact camera and a huge number of b&w roll films in my small darkroom. I took pictures of everything that stood still quite long enough to become sharp on film. I wanted to capture the whole world with my images. Photographers like Ansel Adams or Henri Cartier-Bresson have influenced my photography very much – although one might not believe that considering my photographic portfolio. Their distinct imagery, their clear compositions, the consequence and eternalness of their images are absolutely impressive to me even today. I was also influenced by the paintings of the famous German Romantic Caspar David Friedrich. As a child I admired his paintings in my parent’s books, and later on I often stood at the same locations where he had made sketches for his pictures. Becoming a nature photographer was a rather fluent process. I was always lucky to meet people who encouraged me to go on. And today I’m fortunate to share this passion with my partner. How did you become involved in the Wild Wonders of Europe project? Has it influenced your work since? At the time when the organizers of the WWoE project were choosing photographers for the several missions there were very few seriously working female photographers. For me this project offered great opportunity. I was allowed to work on certain photographic subjects intensively in regions that I’d never been to before. And moreover it gave me the opportunity to meet other photographers and learn about their way of working. I learned a lot during this time and I also managed to intensify my personal style of photography. In most photographers' lives there are 'epiphanic’ moments where things become clear, or new directions are formed. What were your two main moments and how did they change your photography? Landscapes do offer a lot of time for involvement. I’m able to watch intensively, able to change my position or perspective. I’m allowed to wait for a change of light, seasons or vegetation. It’s possible to come back again – and take my picture. Landscape photography matches my mentality, and my approach to photography. And after all, landscape photography offers a perfect argument to be all alone at the most beautiful locations at very unusual times of the day. I was educated in a skilled trade and I’m also working in this sector. This job gives me financial safety, but photography stays my big passion. Relatively few of your images feature broad views (and even fewer the horizon or sky). Have you always been drawn to more intimate landscapes and projects? If you intend to take pictures of a great landscape, you have to know exactly how to compose to capture its certain character. I know of very many images that show that a photographer wanted to put too much information in it, failing in the end. For me reduction is the way. Of course I can photograph a forest panorama. But I can also try to capture a detail of the scene which could be the perfect quintessence. It is only one of many ways in landscape photography – my way. Sometimes this kind of photography could also be the result of very simple circumstances: not enough time, bad light and wrong location and the strong will not get back home without an image. I work with a Nikon D700 and a D300. Usually I use a 24-70mm lens or a 70-300mm, sometimes the macro lens, nearly always a polarizer and tripod. The zoom lenses offer the possibility to make the right composition within a very short time. I like the saturated colours of the polarizer, which also removes reflections on the water when you want to work out the colours of the surroundings. The tripod allows long exposure times, which I love to use, and it gives you time to concentrate on a perfect composition. I grew up with the frame of a negative film. To come home with a properly exposed and clearly composed image was always the target and it still is. My images arise in the camera, out there in the field. On the computer I do only things like minimal cropping, a little brightening of certain areas, shadows and highlights and adaption of levels. I always try to reduce this part of photography to only the bare necessities. I mainly show my images in small exhibitions. Marc Hesse – photographer, web designer and fine-art printer – is a great partner for me, and is able to produce enchanting prints on Hahnemühle paper from an accumulation of digital data. I love the haptic of these papers, their fine structured surface and the brilliant colours of the pigment inks. “The House in the Woods“ by Kai Fagerström, Risto Rasa and Heikki Willamo – an enchanting book about abandoned houses in the forest and their new animal dwellers. Vincent Munier’s “White Nature” – how many colours can winter show? A silent feast. And from the same author “Au fil des Songes“ – poetry from cover to cover. Jan Töve’s “Beyond Order” – a book for all those who want to know what nature photography could be. And I’m especially looking forward to a book about the North that will appear in 2015. It’s called “LYS”, a book by the German photographers Sandra Bartocha and Werner Bollmann, whose development I have been following for a while. But when I’m outdoors I try to forget all these images to be free for my own cognition, feeling and my own images. Movement (of wind, or water, or by camera) is often part of your compositions. In others the emphasis seems to be on quietness, or recollects a dream. Are these conscious choices or the result of an open mind? I am consciously deciding which photographic technique I use depending on the situation and the subject. For me as a photographer it is the most exciting experience to be outdoors, at the sea or at a creek, capturing the dynamic of water and the ephemeral play of colours. It is an almost meditative moment to watch the wind blowing over a grain field, seeing the stems bowing and dancing, and catching this movement with my camera. I like moving the camera due to the graphic results and focussing on only a few colours and structures. I love working with double exposures to accentuate subtle colours or soft light moods. In this context it is very relevant to me to use photographic techniques only for a certain purpose, never for the technique itself. And sometimes pure and sharp is simply the best. This is an image out of my series “Seeland Fragmente I”. While it is four years old, I still like it very much. Because of the movement of the camera a rather simple scene – reed stems at the shore – has been graphically concentrated. The image is characterised by a differentiated and restrained colourfulness. This forest landscape is located at the edge of a huge bog in the Müritz National Park. Thick mist was covering the landscape. The humidity was caught in thousands upon thousands of spider webs creating a dreamlike scene. Using a double exposure I tried to accentuate the soft light and the surreal mood. This is one of my images from the series “Waldsichten“. Due to the panning of the camera the structures of the tree stems have been condensed and it seems as if you could feel the cold winter wind and the swirling snow. I always try to touch the spectator emotionally and likewise to tie in with my memories. Orsolya and Erlend Haarberg from Norway; Hugo Wassermann, Georg Kantioler or Sepp Hackhofer from South Tyrol; and, in the next year, Sandra Bartocha and Werner Bollman with the "LYS"-Projekt (they have fantastic pictures from Scandinavia). Claudia would like to greatly thank Werner Bollmann for his help in translating her answers. Between them they have expressed most eloquently the passion that Claudia has for the natural world and her relationship with the camera.